Philips and TP Vision plot return to prominence with 2013 TVs | What Hi-Fi? If ever a company was in transition, it's Philips of 2013. Example: despite this being Philips' 85th year of TV production, the televisions that will from now on bear the name are, in fact, the product of an autonomous company called TP Vision. Philips and TP Vision entered a joint venture for its TV division: it's now 70% owned by TPV of China and 30% by Philips. This arrangement coincides with a) a seeming willingness to admit product shortcomings previously denied/ignored and b) an overt desire to restore Philips-branded TVs to a position of prominence in the UK they haven't enjoyed for some time. TP Vision has identified a couple of ways to bring the Philips brand to a position of TV preeminence. Firstly, there's a truly comprehensive range for Philips 2013 TVs. 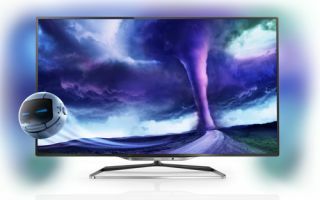 Philips' 2013 TV range opens with the 3000-series, a much more budget-orientated range than we've seen from Philips in years. Move up the range, and you gain features, design elements and aesthetic loveliness through the 4000-, 5000-, 6000-, 7000-, 8000- and 9000-series. In total, TP Vision is launching 35 Philips models in the UK this year. And for once Philips TVs will be contemporaneous: launch dates run from March to June, rather than limping to market in October/November time as has lately been Philips' wont. Secondly, and perhaps more obviously, TP Vision is targeting a much more aggressive High Street presence through the likes of John Lewis and Richer Sounds. As regards the products themselves, TP Vision wants to draw on Philips' technological heritage (Ambilight, motion processing etc.) at the same time as raising its game where the likes of Smart TV and interactivity are concerned. Consequently there's a far larger (and far more convincing) emphasis on apps, social interactivity and DLNA-based functionality, such as screen-mirroring, than ever before. The more premium model ranges include integrated cameras for Skype; EPGs now include Catch-Up TV options; USB recording (including of encrypted broadcasts) is available on every Smart model. And as well as attempting to bring every aspect of the Philips TV brand up-to-date, TP Vision is also working at the authentically cutting-edge. The company isn't exactly making with the details, but a 4K TV in time for IFA later this year seems a genuine prospect. Bigger than 60 inches and badged as part of the upcoming 9000-series, it'll feature what TP Vision is calling 'ultra resolution'. After all, it's obvious that 4K sources and delivery systems are so thin on the ground as to be virtually non-existent, so a 4K panel's ability to convincingly upscale a Full-HD image (and so effectively make up 75% of the on-screen information) will be critical. Add to this a high-concept design statement due to be unveiled in mid-March and it's obvious that these are genuinely interesting times for the Philips brand and a real examination of TP Vision's credibility. At least this new alacrity at actually delivering new products at more-or-less the same time as its nominal competitors means we won't be waiting all that long to find out just where Philips stands.